Huawei's Mate line of Android smartphones premiered in early 2013 with the Ascend Mate, eventually dropping the Ascend moniker in 2015 with the release of the Mate S. The series skipped from the Mate2 to the Mate7 for unknown reasons, and then added a space in the model names starting with the Mate 8. The Mate smartphones started out as primarily mid-range phones aimed at those who can't or won't pay top dollar for a flagship phone, but Huawei started to delve into premium handsets with the introduction of the Porsche Design option in 2017. The Porsche phones, along with the Pro subset, feature higher resolution screens and top-notch design. All of the Mate phones have large, phablet-sized screens. May not sell in the U.S. 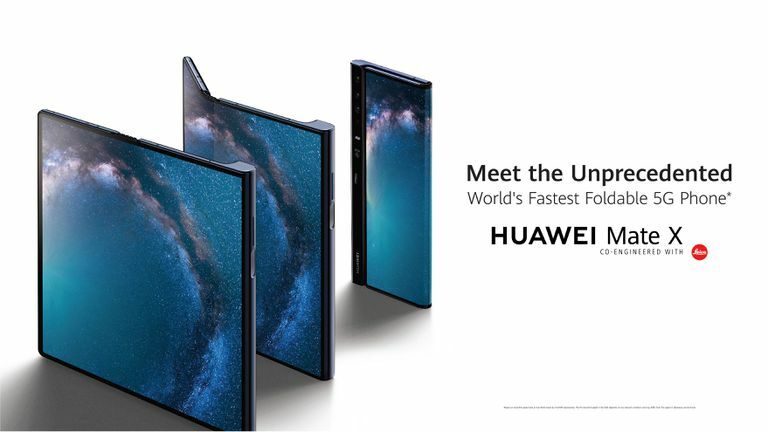 The Huawei Mate X is the company's foldable smartphone and its answer to the Samsung Galaxy Fold. It folds out to an 8-inch tablet and collapses into a 6.6-inch smartphone that's just 11 mm thick (0.43 inches). There's also a 6.38-inch screen on the back when the phone is unfolded. You can take photos when the device is folded or unfolded and the secondary screen on the back of the phone turns into a mirror so your subject can preview the shot. The device has two batteries, adding up to 4500 mAh of power, and fast-charging; the company says you can get to 85 percent power in 30 minutes. This glass-constructed Mate 10 Pro smartphone is the first in the Mate series to forego a memory card slot and a headphone jack, but it comes with 128 GB storage and a Type-C to 3.5 mm headphone jack adapter. The Mate 10 Pro also moves the fingerprint sensor to the back of the phone (just under the camera) and is water resistant. The Mate 10, discussed below, has its fingerprint sensor on the front, but previous models placed it on the back panel. Many of the Mate smartphones have Leica-designed cameras, including the 10 Pro. The primary camera has a 12-megapixel sensor takes color photos and a second 20-megapixel sensor that shoots only. This dual lens construction allows for the Bokeh effect, in which the foreground is in focus, and the background is blurry. The selfie camera has a wide-angle lens so that you can squeeze more people into your vanity shots. This smartphone has an 18:9 aspect ratio, like the Huawei Honor 7X and others in the Honor series of smartphones and the HTC U11 EYEs. The 18:9 aspect ratio makes better use of large screens, compared with the previously standard 16:9 aspect ratio. Huawei adds several gesture controls on top of Android's operating system, such as launching split-screen mode by swiping your finger across the screen. The Mate 10 Pro supports fast charging, via Huawei's SuperCharge technology, but not wireless charging. This big phone has a big battery to match (4,000 mAh), and it's claimed to last up to two days between charges. Desktop mode: A feature called Easy Projection lets you plug your 10 Pro smartphone into an HDMI-compatible monitor (HDMI) to get a desktop experience. You'll need to supply a USB Type-C to HDMI cable, which Huawei does not sell, but you can use your phone as a virtual mouse and keyboard. Navigation Dock: This feature makes the large phone more comfortable to use with one hand. The navigation dock floats over the screen or app you're using, and you can tap and hold it to move it around the screen. Tap it once to go back. Press and hold to go home. Press and swipe right to open a menu that you can use to switch to another open app. App Twin: If you have more than one login for a social media platform, such as one for personal use and one for work, you can open two instances at once. Note that not all social media apps support this function. Not released in the US or UK. The Huawei Mate 10 is the first in the series to use artificial intelligence in its camera to recognize scenarios including people, flowers, food, and pets, and adjust the settings accordingly. Unlike the Mate 10 Pro, the 64 GB Mate 10 accepts microSD cards (up to 256 GB) and retains a headphone jack. It's also not water resistant. Like the Mate 10 Pro, it has a Leica-designed camera. It has a glossy glass finish and an improved version of Huawei's EMUI skin. Unlike others in the series, the fingerprint sensor is on the front of the phone. A 6.0-in AMOLED screen with a resolution of 1080x2160 @ 402ppi. 256 GB of built-in storage, and no card slot. Dust, splash, and water resistant. Comes in an exclusive glossy finish called Diamond Black with a vertical racing stripe. Comes with accessories, such as a Porsche Design folio case. The 5.9-in IPS LCD has a resolution of 1080x2160 @ 409ppi. The front camera has dual 16 MP/2 MP sensors. The rear camera has dual 3 MP/2 MP sensors. Its charger is micro USB. It shipped with Android 7.0 Nougat. Not released in all countries. The Mate 9 incorporates artificial intelligence and will learn from your habits and optimize its performance. For example, if you open the gallery app every time you close the camera app, the phone will divert resources to the gallery app, so it opens faster. Like the Mate 10 and 10 Pro, it has a dual sensor Leica camera that can achieve a depth-of-field effect and you can choose how much blur you want using a slider tool. Unlike the Mate 10, its fingerprint sensor is on the back of the phone, just underneath the camera. It comes with 64 GB of storage, and accepts memory cards up to 256 GB, and retains the headphone jack. 5.5-in AMOLED screen with a resolution of 1440x2560 @ 534ppi. 256 GB built-in storage; no card slot. Only comes in a brushed black finish. Comes with Porsche themes and apps. The most notable thing about the Mate 8 is its improved fingerprint sensor, which sits on the back panel underneath the camera. It’s the same sensor as the one in the Huawei-designed Google Nexus 6P, as is more accurate. However, the Mate 8's screen is low res and dim. Like the Mate 9, it has a headphone jack and accepts memory cards up to 256 GB. The smartphone comes in two configurations: 32 GB and 64 GB. The Mate S integrates a pressure-sensitive display, similar to the iPhone's 3D touch, which can respond to "press and hold" gestures. For example, you can press on an app icon to get related commands, but oddly, it doesn't work with all of Huawei's bundled apps. Another way to use it is to call up the navigation soft keys (home and back) by pressing on the screen, keeping them hidden when you don't need them. Like the Mate 10 Pro and Mate 9, the fingerprint scanner is just below the camera on the back panel. The Mate S also adds a beauty mode for selfies, but it adds a sort of "Vaseline lens" look, and the effect at its highest setting (it's adjustable from 1 to 10), as demonstrated by a CNET reviewer, will chill you to the bone. Otherwise, it's similar to other Mate smartphones, with a headphone jack, and a card slot that accommodates up to 256 GB cards. The Mate S is available in 32, 64, and 128 GB configurations. Constructed of matte metal with a large, bright screen rimmed by a slim bezel, the Mate7 is the first in the series to have a fingerprint scanner, which is just below the camera and can wake the phone from standby and authenticate mobile payments. The screen is low res for its big size, but it has good viewing angles. The Mate7 has a large battery (4,000 mAh), a headphone jack and accepts microSD cards up to 256 GB; it comes in 16 and 32 GB configurations. The Ascend Mate2 has a notable feature, mainly because of its name – grouphie – which lets you take panoramic selfies. The feature works only in portrait mode and stitches together three shots so you can fit more people or scenery into your selfies. This phablet also has a glove mode and a one-handed mode for better usability. The Mate2 has a headphone jack, 16 GB of storage, and accepts up to 64 GB memory cards. The Huawei Ascend Mate phablet is made mostly of matte plastic, which makes it easy to grip, if not very stylish. It has just 8 GB of onboard storage, but can accept microSD cards up to 64 GB; it also has a headphone jack. The Ascend Mate has a big 4050 mAh battery but doesn't support wireless charging. More importantly, it doesn't support 4G LTE for faster web browsing speed.